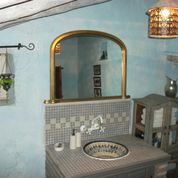 MNGS offers your family or group a fantastic holiday located within a National Park in the southern mountains of Spain. 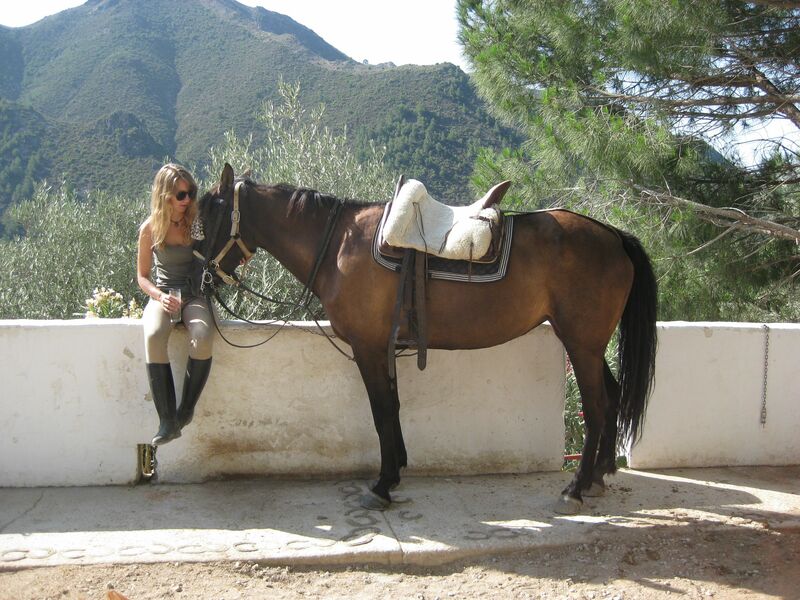 Originally created from a working olive farm (finca), our ranch becomes your own villa/horse ranch with serenity, fantastic views, a private swimming pool, the creative culinary arts of our chef Donna, and fine professionally trained horses. These year-round holiday trips last from 4 – 14 days, and are only a 2-hour flight from Geneva. Meals are customized for your tastes, created with fruits and vegetables grown on the ranch’s garden, tended by ‘Jeff’, who cares for it lovingly. The pool is located with a stunning view of the surrounding mountain valleys and the Mediterranean Sea. 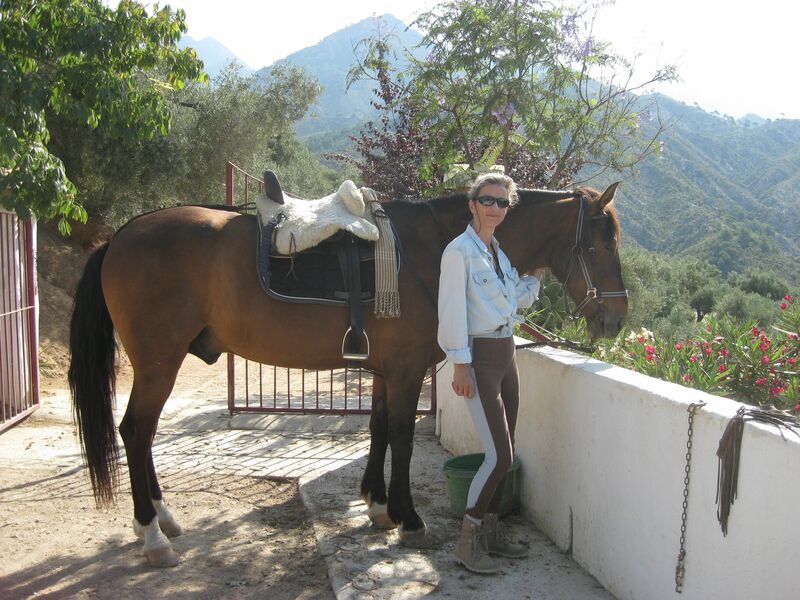 Our horses have been selected from some of the finest Andalusian stock, professionally trained with loving care, so they are both gentle, responsive and cooperative with our guests during our half or full-day rides through the mountains. They love to run on command, but are easy to handle for beginners and experienced riders alike, and they enjoy their pampered life at this idyllic remote ranch. 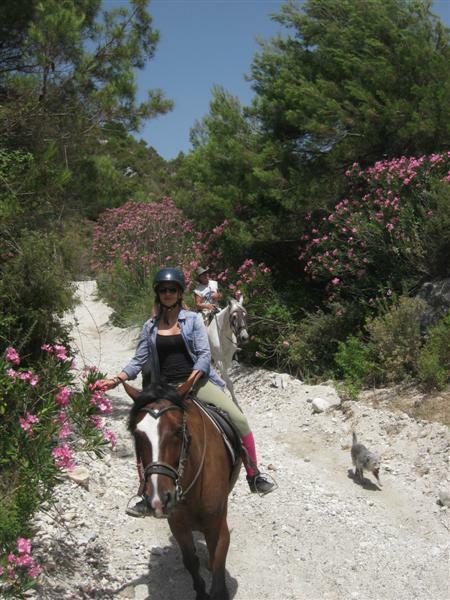 If you do not wish to ride, we can also arrange walks throughout the surrounding mountains, mountain biking, visits to the beaches or traditional festivals in neighbouring mountain villages. Come join us for a fine holiday and lifetime experience, with well-appointed and comfortable accommodations, excellent cuisine, well-trained horses and the friendliest staff of professionals anywhere. MNGS is proud to offer this wonderful experience to our clients, so please ask for pricing and booking information so you can enjoy this amazing holiday get-a-way with us any time of year. All rides are accompanied by experienced guides and tailored to each individual’s ability. Time spent riding during a day can also be tailored to your requirements. Programmes: Short break mountain holidays are available, or you are welcome to stay as long as you wish. Riding is optional with as much or as little as required. Our rides head through breathtaking mountain ranges, by rivers and waterfalls, or to the nearby Moorish villages. Relaxing lunches are either picnics high in the Sierras or local Spanish tapas in a traditional bar. We have horses for all abilities of rider, from complete beginner to advanced riders. 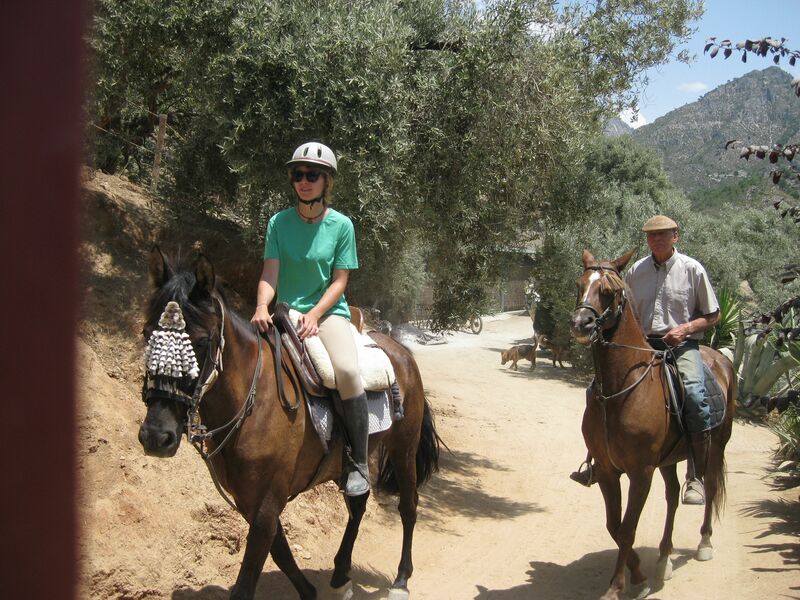 We love to teach first-time riders the joys of riding and how to communicate with our horses. For the more adventurous, we suggest a ride we do to Jatar, along the historic mule tracks through the remote national park and over the mountains. 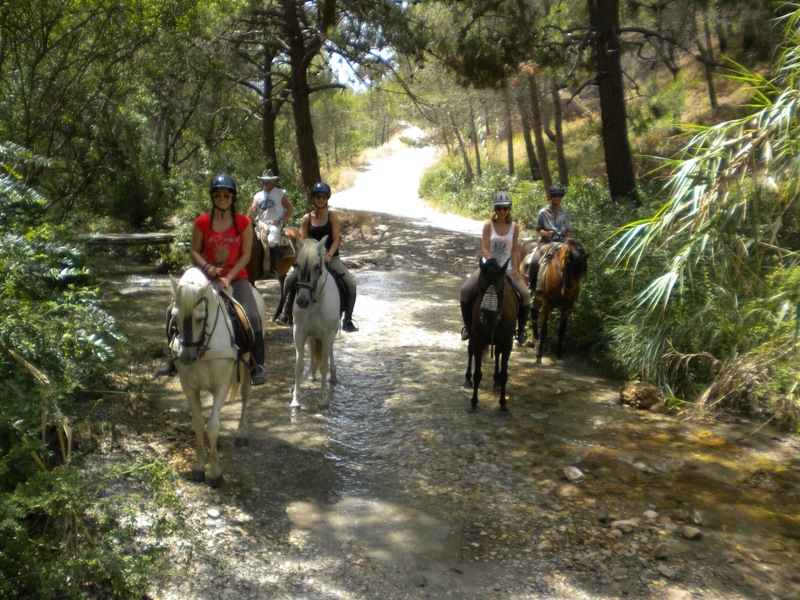 Special trips can be arranged to take part in the traditional festivals in the local villages – this is a truly amazing experience and makes you one of the locals on a beautiful Andalusian horse you have prepared yourself. 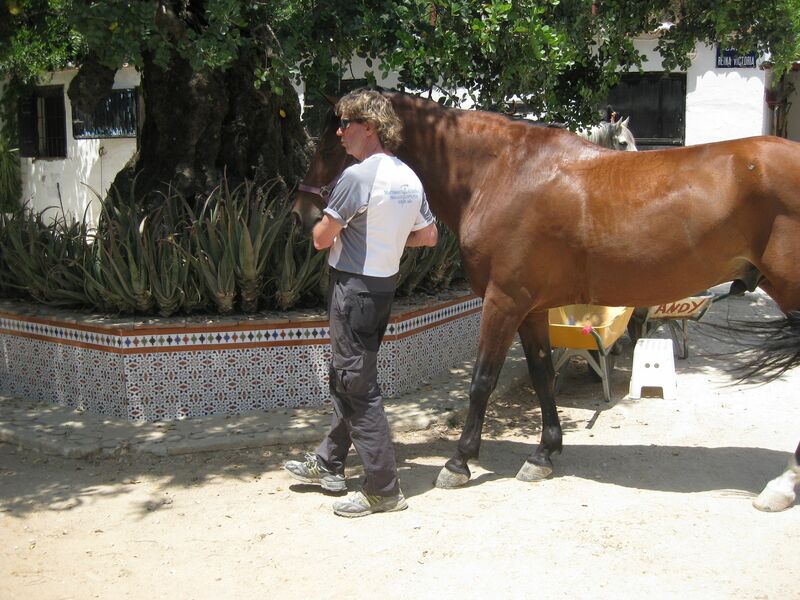 Horses: Fit, even-tempered proud Andalusian horses, individually matched to each rider. 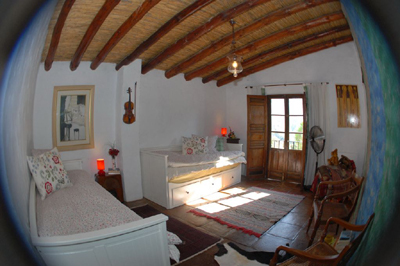 Accommodation: Your accommodation on our farm comprises of a typical Andalusian 3 bed-roomed finca. 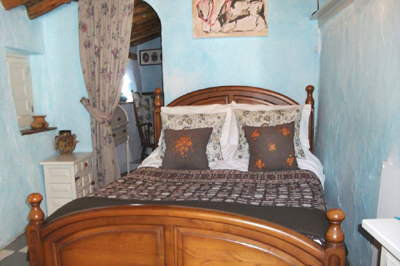 It is fully self-contained, with two double-rooms, one single room, small lounge, kitchen and bathroom. You have a private swimming pool and can relax in the extensive terraces and gardens. Also, we have a self contained apartment with a family room that can sleep a maximum of four. 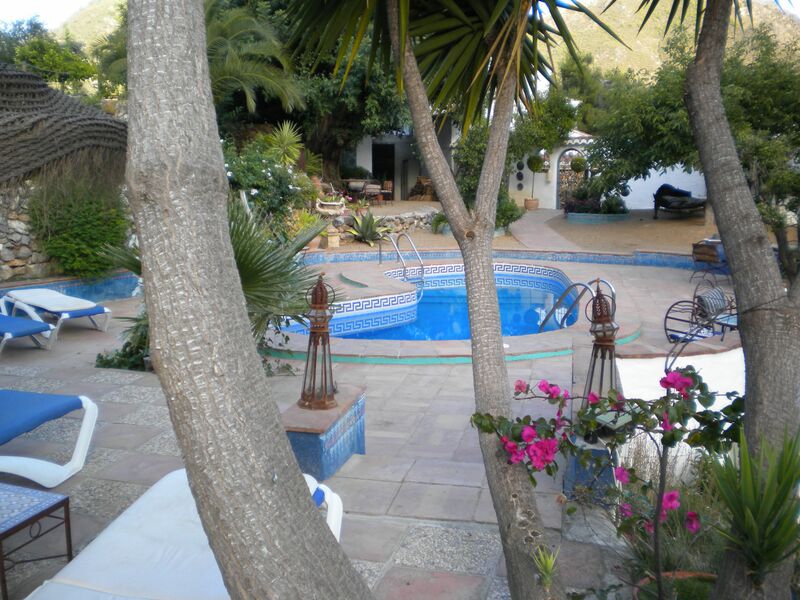 Location: We are about an hour from Malaga international airport, The nearest villages are Competa and Frigiliana, both less than 10km away. 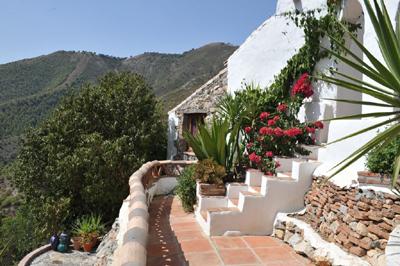 The ranch is a rural finca, high in the mountains accessed by a 20 minute drive along a winding unmade road. 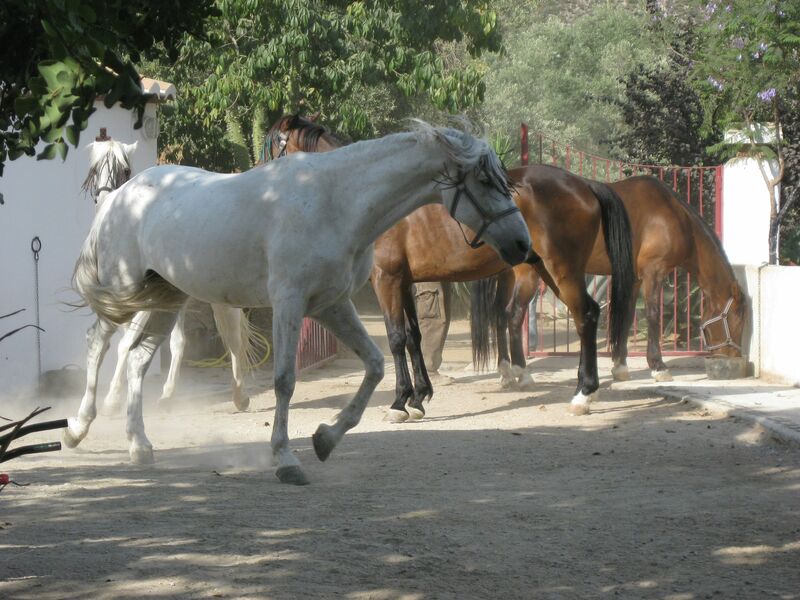 It is a unique base for riding within the “Parque Natural Sierra Tejedas, Almijara & Alhama”. The area around the finca is home to ibex (bouquetin), wild boar (sanglier), stone martens, foxes (regard), badgers, genet, rabbits, Egyptian vultures, red kites, harris hawks and imperial, golden and Bonelli’s eagles. Designated a natural park in 1999, this large and rugged mountainous region of 40,663 hectares stretches across the provincial border of Granada and Malaga . 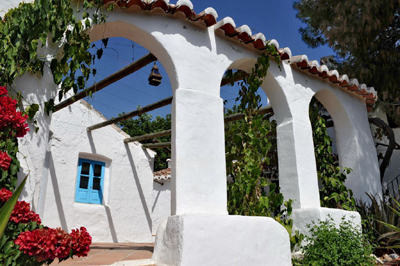 Its western part in Malaga province is known as the Axarquía, famous for its attractive villages dating from Moorish times. It is also superb hiking country, and its numerous steep mountain sides make it ideal for climbers, with its highest peak being La Maroma (2,080m). Natural parks are locations of great ecological, scientific and educational value, as they have ecosystems that have been little altered by human intervention. Transport and transfers can be arranged on request. We require a deposit of 20% on booking with the balance payable 6 weeks prior to the reserved dates. If your booking is being made on “short-notice” (less than 6 weeks prior to vacation dates), we require full payment along with your confirmation. Cancellations: Deposits are only refundable if another booking is obtained for the same dates. If the cancellation is 8 weeks or more before the vacation dates, 50% of the deposit will be refunded. Insurance: We recommend that you confirm with your Travel Insurance provider that your policy covers you for all the activities you will undertake during your stay with us. Regarding safety equipment, please note that everybody will be expected to wear a riding hat. You will need to provide your own additional safety equipment (e.g. body protectors), if desired. We offer a Holiday Feedback Form, and hope that all our visitors have a very enjoyable holiday. We always endeavour to do our utmost to ensure that this is the case. Prices: Prices are the same throughout the year (except Christmas & New Year). We offer our Andalusian Mountain Retreat on a per night basis (3 nights minimum), our Ride to Jatar excursions, etc, and we visit local Fiestas of Andalusia to participate in these traditional Andalusian celebrations. Of course, any combination can also be tailor made. : Please ask us for availability or to arrange your tailor made holiday.